White bits in stool are not a common occurrence and can be caused by a number of health concerns. Sometimes the white bits in stool can resemble white specks or spots, other times it could look like a whitish substance that discolors your stool. Usually, noticing white pieces in the toilet after passing stool once or twice isn’t something to be concerned about. However, if you regularly notice bits of white stuff or specs that look like tiny white balls in your stool, you should visit your doctor for a checkup. There are many reasons for white particles and clumps of whitish matter to be found in your feces. The white bits could be a sign of a fungal infection or that you have parasites in your gut. Also, digestive issues can cause white mucous to appear along with stool. Some more serious medical problems can also cause most of your stool to turn a whitish-gray color. In these cases, you won’t just notice white bits in your stool but all your stool will have a pale color. In this article, we will look at the causes of white specks in your stool and also examine some of the reasons why your stool can change color. Actually, the color of your stool can tell much about your health in general. However, noticing white bits or lumps in your stool is not something to be ignored. Here are some of the reasons why you may notice white particles in your stool. You will also find out what you can do to address any underlying health issue that may cause discolored stools. The white substance in your stool could be mucous. Stool usually contains small amounts of mucous that aren’t usually noticeable. However, large amounts of a whitish substance in your stool might be a sign of a digestive disorder. IBS can be a tricky digestive problem to manage. However, readers of this website have found helpful advice to manage the symptoms of IBS in my article on the best herbs and natural treatments to relieve IBS. If you think that you have parasites in your intestines, there are many foods you can eat to help get rid of the parasitic worms. One of the best foods to eliminate parasites is garlic. Garlic works as an antibiotic in the body and helps to flush out various parasites. Food grade diatomaceous earth (DE) is also a natural and effective way to eliminate internal parasites. A study published in the Journal of Poultry Science found that DE has the potential to be an effective treatment to help control parasites.13 When buying diatomaceous earth, be sure to look for a brand that is food grade, meaning that it is safe to ingest. A fungal infection may be to blame for the appearance of small lumpy white balls in your stool. Fungal infections are commonly caused by an overgrowth of Candida albicans yeast. This can happen if your immune system is severely weakened or you have been taking a course of antibiotics. Candida yeast infections manifest themselves as clumps of white matter on your tongue, vaginal itching, and sugar cravings. The white specks of candida infection can also come out in your stool. For more information on how to prevent and treat a fungal infection naturally, please read my article on the best natural treatments for treating candida. Parts of your stool could look white or pale because of too much fat content in your stool. This is a condition called steatorrhea and is caused by malabsorption. Malabsorption describes a condition where the digestive system can’t absorb certain fats, sugars, proteins, or vitamins. The reason for part or all of your stool being white is that bile produced by the liver is needed to break down fat. It’s the bile that gives your stool the typical brown color. If there is not enough bile produced by your body, then this can cause your stools to have a whitish appearance. There can be many reasons why malabsorption occurs in your body resulting in steatorrhea. Usually, when these underlying causes are treated, your stool will return back to its normal color. You can read more about this condition in my article on why you have a greasy stool and what to do about it. Sometimes you may notice that you don’t just have specks of white matter in your poop, but all your poop is a pale color. Please read on to find out what could be causing whitish stools and when you should see a doctor. Usually, when you stop taking the medication causing pale stool, your stool should return to its normal color. There are other symptoms of liver disease that you should be aware of. Some of these are jaundice, abdominal pain, dark yellow urine, and bruising easily as well as others that are mentioned in my article about early signs of liver damage & how to strengthen your liver. One way to remove gallstones is to drink lemon water. The acidic content of lemon helps to dissolve gallstones and flush out toxins from your liver. Lemon water helps to boost your digestive process and get your digestion working properly again. However, you should visit your doctor if gallstones cause pain and discomfort that doesn’t go away. Change in stool color when it becomes white or pale-looking could be caused by pancreatic disease. Pancreatitis can affect your digestive system causing malabsorption and a higher fat content in your poop. Some other symptoms of pancreatitis are a sharp, shooting pain under your ribs, fever, nausea and vomiting, or increased heart rate. Biliary atresia is a condition that can affect newborns and is caused by blockage of the bile flow from the liver to the gallbladder. If you notice that your infant has pale colored stool, you should talk to your healthcare provider immediately to arrange tests and the appropriate treatment. MayoClinic. What causes mucus in stool? NIDDK. Symptoms & causes of irritable bowel syndrome. Saudi J Gastroenterol. 2012 Nov-Dec; 18(6): 392–393. Clin Infect Dis. 1995 Oct;21(4):881-6. MedlinePlus. Stools – pale or clay-colored. GlobalRPh. Agents which may discolor feces. MayoClinic. What would cause a person to have white stool? I had white specks in my stool and went to my GI to figure it out. The white specks I experienced were caused by constipation. 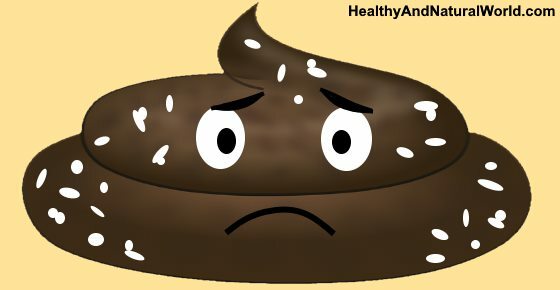 You can still be constipated even if you’re having bowel movements daily, especially if you’re not having a full bowel movement (for example, if you push when you go to the bathroom, you’re turning off your body’s peristalsis and you will not have a complete movement, aka some will still be left in there). Biggest tip: do not push when you go #2. Your body will do it for you. If you push, your body stops doing it for you and you have to wait until it decides to do it again, which leads to constipation. The white specks are coagulated mucus from the mucus that your body produces when you’re constipated to try to help things move along and get the excrement out of your system. When that mucus is in your body for too long (because you’re constipated), it turns into little white specks/dots/etc. It’s kind of like the calcification that happens when people get tonsil stones. (1) Find a diet that works for you which likely won’t be what the online “experts” say. Do not go crazy eating vegetables if you’re constipated because it will have the opposite effect and not help you. (2) I began doing pelvic floor exercises. If you have constipation, these are a must and a life saver. Once the pelvic floor exercises start working for you, immediately stop all laxatives and similar (like Linzess). Those are not good for your gut but they’re necessary until you build up your pelvic floor muscles. (3) Walk for at least 30-60 minutes a day and drink a bottle of water during that walk. (4) Do not bother with probiotics. Too many of them mess up the balance of your gut and have the opposite effect: bloating, pain, constipation. If you get the balance just right, they can be somewhat helpful, but it’s not worth it. Your gut will balance the bacteria out on its own from a regular, decent diet. Those solved my constipation problem entirely (and I didn’t even know I was constipated since I had a BM daily), and now I’m 100% back to normal. I haven’t seen a white speck in many months. Good luck to anyone else with this problem. There is hope! Thank you for sharing! I’m glad that you are fine now.